Charcot Joint, also known as Neuropathic Arthropathy, is a common side effect of diabetes that causes deformities in the foot and ankle. Symptoms usually include swelling, redness, as well as visible deformities. Your Florida Orthopaedic Institute physician will take a look at your symptoms and determine the best treatment plan for you. For less severe cases, non-surgical treatments will be recommended. If non-surgical treatments are unsuccessful, or if the condition is severe, then surgical options may be proposed. 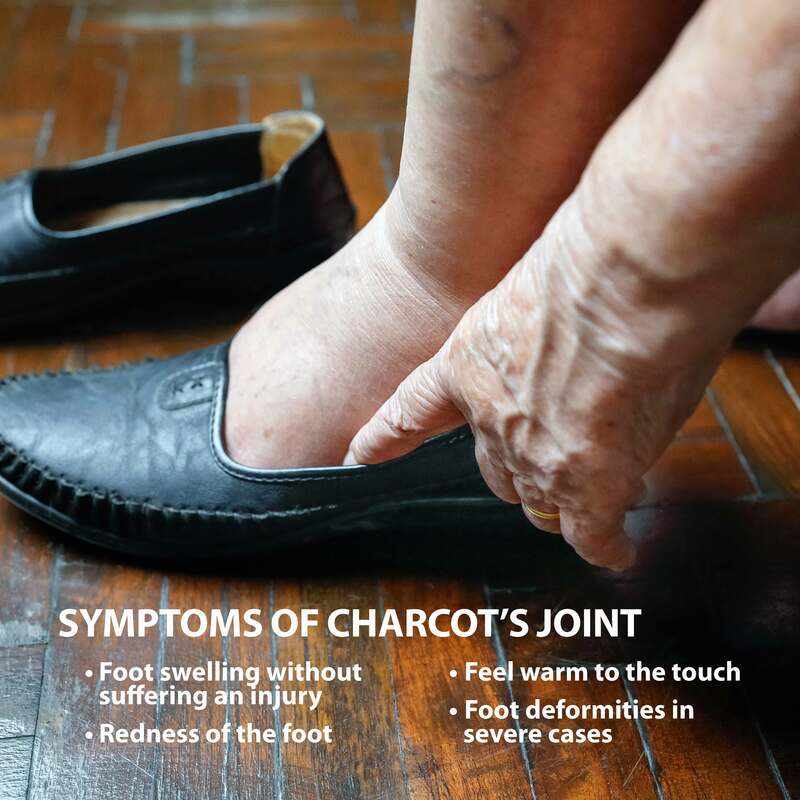 Charcot Joint may affect any part of the foot and ankle, including (in decreasing order of frequency) the midfoot, hindfoot, ankle, heel and forefoot. Many regions may be concurrently involved. Fractures and dislocations can involve several bones and joints, with extensive fragmentation and deformity. Charcot Joint, also known as, Neuropathic Arthropathy, is a common complication of diabetes that causes deformities in the shape of the foot. Nerve damage, also known as neuropathy, is a complication of diabetes that leads to a loss of sensation in the feet. Having no feeling in the foot means that there is a high chance you will not notice that something has irritated and or punctured in the skin. A blister can turn into a serious infection in a matter of days. Diabetes can also damage blood vessels, decreasing the blood flow to the feet. Poor circulation will weaken bone, which can cause the bones and joints in the foot to break easily. Poor circulation and a loss of sensation mean that if you break a bone in your foot, you will not realize it, which will increase the risk of chronic foot sores from the abnormal pressure. Neuropathic patients with a tight Achilles tendon have a tendency to develop this condition. X-rays. These imaging tests provide detailed pictures of dense structures, like bone. In the very early stages of Charcot Joint, the x-rays may not show anything. But if the condition as progressed, then multiple fractures and dislocations of the joints are seen in the x-ray. Magnetic resonance imaging (MRI) and ultrasound. This test creates images of soft tissues in the foot and ankle. Your physician will order these if they think you have a bone infection. Bone scan/indium scan. A bone scan is a nuclear medicine test that is very effective in determining if you have a bone infection. An indium scan is a specialized test that involves placing a marker on white blood cells, and tracing to learn whether they are going to the bone to fight an infection. Both Charcot Joint and bone infections will cause a positive bone scan, but only an infection will show increased activity on the indium scan. The primary goal of treatment for Charcot Joint is to heal the broken bones. There are both non-surgical treatments and surgical treatments available to achieve this. Your Florida Orthopaedic Institute physician will work with you to help determine the best treatment plan to fit your needs. Non-surgical treatment options usually work best when Charcot Joint is still in its early stages. One of the most effective treatments is casting. Casting does an excellent job of reducing swelling as well as protecting the bones. With casting, patients will have to keep all weight off of the foot, which will usually need the help of a wheelchair, a knee-walker device, or crutches. Healing usually takes at least three months. The cast is changed every week or two to make sure that it continues to “fit” the leg as the swelling goes down. Custom shoes may also be recommended after the initial swelling has decreased and the bones have begun to fuse back together. Specialized shoes are designed to decrease the risk of ulcers (sores that do not heal). Some diabetics may not be able to wear regular, over-the-counter shoes because they do not correctly fit the deformed foot. Surgical treatments are recommended if the foot deformity puts the patient at high risk for ulcers, if non-surgical treatment were not effective, or if you have unstable fractures and dislocations. Your Florida Orthopaedic Institute physician will determine the proper timing as well as the appropriate procedure for the individual case. There are many different variations of Charcot Joint – each requires a different type of surgical procedure. For example, if the deformity is mild and associated with the back of the heel, then Achilles tendon lengthening may be performed. If the deformity is more severe and has caused a large bony bump on the bottom of the foot, the procedure is chosen based on the stability of the bones and joints in the foot. Your physician will help determine the best surgical procedure for your variation of the deformity. The most important thing to do during your recovery process is to follow your physician’s instructions on when it is safe to put weight on the injured foot. Also, the sooner Charcot Joint is diagnosed, the better the final outcome. Taking care of your foot will help speed up the recovery process, as well as avoid future complications. For more information, contact your Florida Orthopaedic Institute physician.